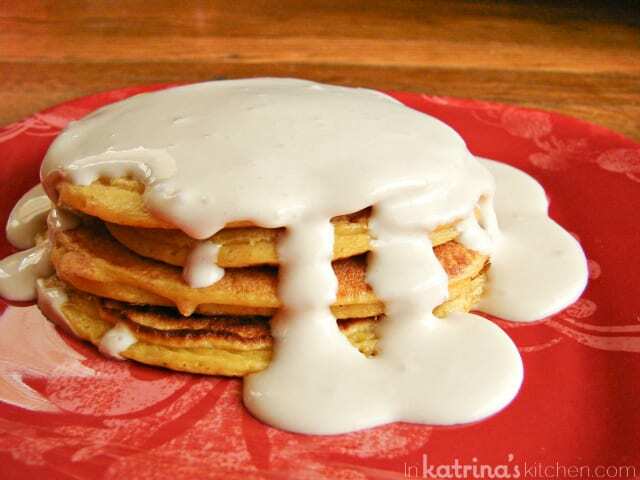 Carrot Cake Pancakes with Maple Cream Cheese Syrup- sure to hurry spring along! Here’s the thing: Why does Spring have to be ruined by weird animal characters. Do any other seasons have bizarre animal lore? The Groundhog? He exists to either dash your dreams of warm weather from the start or seeks to destroy you with his compulsive lies. Easter Bunny? Not enough time. Just no. And why does March have to come in like a lion or a lamb? Am I missing something? Technically we are still in Winter but I am ready for Spring. Once I get a taste of that 40° weather I become an 80 year old woman. I stalk the forecast every night and morning. I complain about the weather to anyone who will listen. I wear short sleeve shirts but I always have a cardigan nearby. Weird animal ‘lore and inaccurate forecasts aside I do love this time of year. I look forward to packing away the boots and gloves. My scarf becomes an cute accessory not a necessity. My scheduled runs become less daunting as I begin to put more miles on the pavement and less on the treadmill. And my kids look forward to longer days and more hours of sunlight in which they can torture each other. Speaking of torture- breakfast. Yes breakfast. It can be torture in our house. My 6 year old just isn’t hungry when he first wakes up. You would think that 6 months of this whole Kindergarten thing would help in that area but he would still rather pass on breakfast and just grab a milk to-go. It’s like he’s a college student and milk is his coffee. But pancakes? Oh he will always line up for pancakes! My toddler has this thing against eating protein with breakfast; I swear he senses it. I casually try to offer him something remotely filling and he rejects it with a fierce strong will that only toddlers can summon. So that’s why I started sneaking Greek yogurt into their pancakes. It’s packed full of protein! My favorite is Chobani and my refrigerator is never without it these days. At first I just added a container to a standard box mix batch of pancakes. 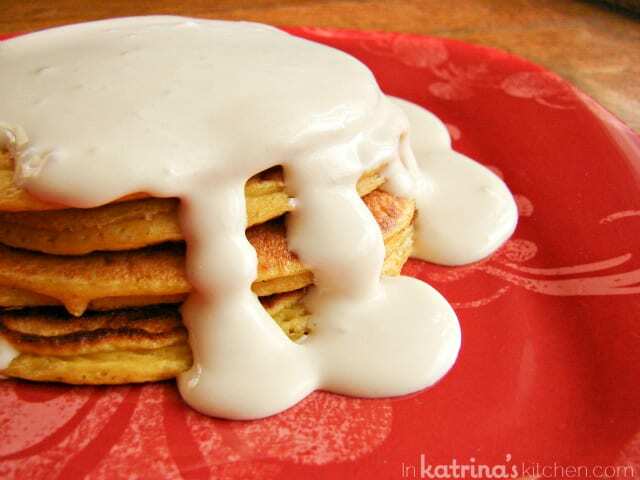 As the winter droned on I got a little bit more creative and these Greek Yogurt Carrot Cake Pancakes were born! Combine yogurt, egg, and carrots and stir until creamy. In a separate bowl mix together flour, baking soda, and pumpkin pie spice. Mix together the wet and dry ingredients until combined. You may need to add a tablespoon of water (thin to desired pancake consistency). Preheat griddle or large pan to medium heat. Spray with cooking spray and spoon batter onto griddle. Cook until bubbles form on top (2-3 minutes) and flip. Cook for and additional 1-2 minutes until cooked through. Place cream cheese and syrup in a small microwave-safe bowl. Microwave 1 minute (or longer) until cream cheese is melted. Stir and pour over pancakes. Do you have the calorie count for these pancakes? I don’t include calorie counts on my posts but you can use Spark People Calorie Counter or My Fitness Pal Recipe Builder. Thanks for stopping by! I’ve been wanting to try Greek yogurt pancakes for a while now, and these look so good! The syrup looks sooo goodddd too omg. These look insanely good!! Love carrot and pumpkin together. 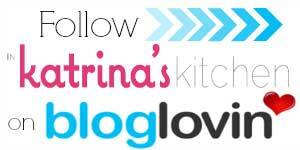 Oh Katrina, I totally pinned, then shared with my FB followers and Twitter followers and basically my whole mini world!!!!!!!!!!! AHAHAH! These look di-vine! I am ready for spring, too. I’m also ready for a big, heaping pile of these lovely pancakes. Yum! These look SO good. We made carrot cake pancakes from Joy the Baker last spring…. I really need to bring them back. So good… and bring on spring! Wow they look so good! I love carrot cake and this is the best ‘syrup’ I’ve ever seen! OMG, I want to slurp this syrup!!! Yummy and pretty pancakes. I love the flavour combo on these. These would have this non breakfast girl scarfing platefuls. I wish I had all the ingredients to make this for breakfast, it sounds amazing and my husband loves carrot cake!! These are awesome! My 7 year old loves pancakes, he would go crazy for him. He would have a muffin every day for breakfast if it were up to him! Yum! I love Chobani and I’m all over these carrot cake pancakes! 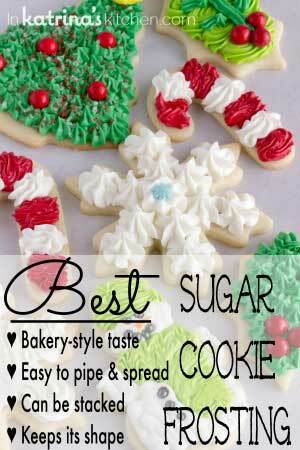 These look amazing, especilly with that syrup of yours overflowing:) You make me laugh too! I have been craving carrot cake lately. Now I want carrot cake AND pancakes!! 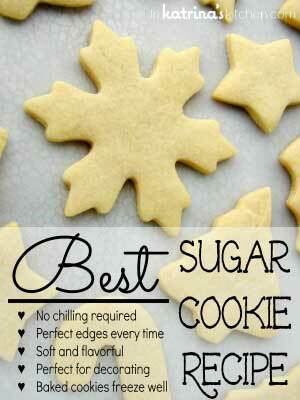 Love this syrup too! Now that is a pancake stack that I want to dive headfirst in to!! 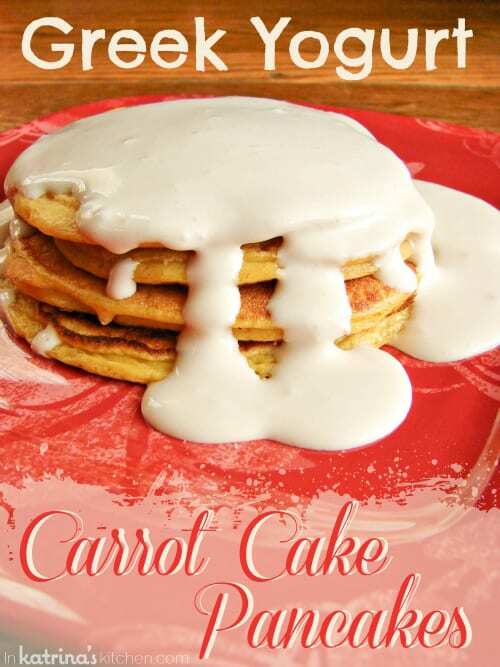 Love that “syrup” and that these are carrot cake! Yum!!! These sound incredible! What a brilliant idea for pancakes. 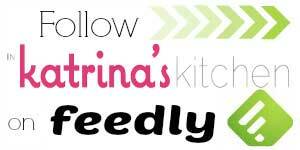 I have been waiting for this recipe since you posted a picture on instagram! Thank you! Love yogurt in pancake recipes — so much more fluffier!! I never thought of it that way, but it’s so true that there’s some pretty odd animal lore associated with spring. And then there’s these pancakes. They’re not odd at all….just gorgeous! 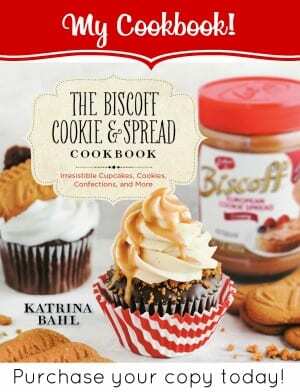 I would love a big stack of these for breakfast! Greek yogurt is a great way to sneak in some protein! Mmm I’m loving these pancakes. Toddlers will always baffle me (and make me laugh) 🙂 Oh and the bunny … I avoid him/it at all costs and yet the other day 5yo asked if the easter bunny is coming to our house. Who told her this??? I’m kind of looking forward to spring as well and the extra light from daylight savings has been kind of nice so far! wow! genius to make a cake into pancakes!! I bet these are beyond good!! I love the idea of extra protein too – good for training!! Such a great idea! I bet my kids would love them!